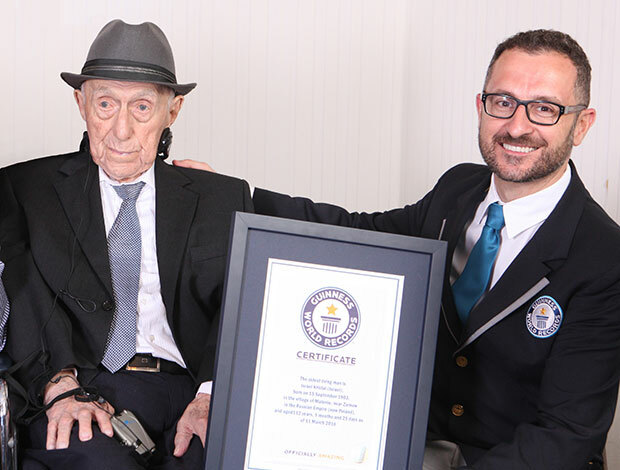 JERUSALEM -- A 112-year-old Israeli who lived through both World Wars and survived the Nazi concentration camp Auschwitz is the world's oldest man, Guinness World Records announced on Friday. Guinness said in a statement that Israel Kristal is 112 years and 178 days old as of March 11. Marco Frigatti, Head of Records for Guinness awarded Kristal a certificate at his home in Haifa on Friday. "I don't know the secret for long life," Guinness quoted Kristal as saying. "I believe that everything is determined from above and we shall never know the reasons why." "There have been smarter, stronger and better looking men then me who are no longer alive. All that is left for us to do is to keep on working as hard as we can and rebuild what is lost," he added. Guinness said Kristal was born in 1903 to an Orthodox Jewish family near the town of Zarnow in Poland. He moved to Lodz to work in the family confectionary business in 1920, it said. During the Nazi occupation of Poland he was confined to the ghetto there and later sent to the Auschwitz and other concentration camps. His first wife and two children were killed in the Holocaust. Kristal survived World War II weighing only about 81 pounds - the only survivor of his large family. He moved to Israel in 1950 with his second wife and their son, Guinness said. In Israel, Kristal "continued to grow both his family and his successful confectionary business," Guinness said. Yasutaro Koide of Japan was the previous oldest man. He died in January at the age of 112 years, 312 days. Susannah Mushatt Jones, 116, an American born in 1899, is both the world's oldest living person and the oldest living woman, Guinness said.